Gordon Rankin of Wavelength Audio is one heck of a talented audio designer and a man of simple tastes - only the best will do. It was Gordon Rankin who first told me about Nirvana cables. He recommended a full set of Nirvana cabling to get the best out of my Avantgarde Duos driven by the Custom 45 amplifiers he hand-crafted for me way back when. Gordon also recommended using a wiring harness for my Duos, similar to the one that he had developed for his own Unos. Gordon connects the tweeter horns and the woofer modules to the midrange horns by dropping a couple of spade-terminated wire pigtails from the midrange horns. 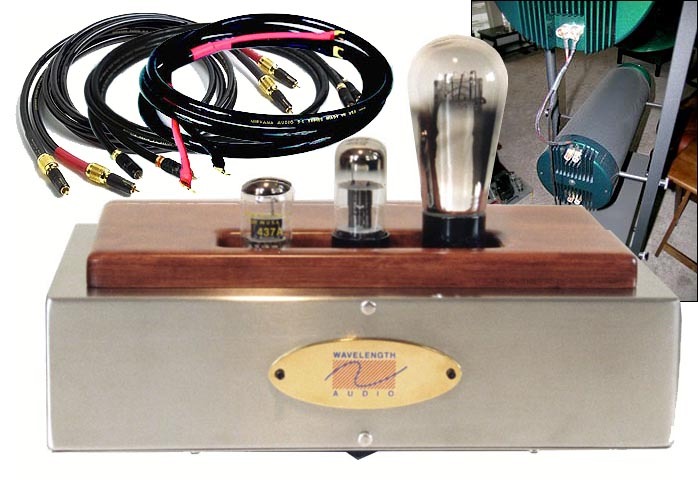 The amplifier is then connected to the midrange horn with banana-terminated speaker cables. At the time, a Nirvana-wired Avantgarde harness was not a commercial product. Gordon made one for me out of Nirvana wire that he had a Wavelength Audio. Eventually word got out about the performance improvement when using Gordon's recipe to wiring up Avantgarde loudspeakers. Due to customer demand, a Nirvana wiring harness eventually did become a commercial product and is now available directly from this firm. I happily used my full set of Nirvana wires and enjoyed every minute with them in the system: Nirvana S-X interconnects between CD player and preamplifier; Nirvana S-L interconnects between preamplifier and amplifiers; Nirvana S-L speaker cables between amplifiers and speakers; and the aforementioned custom Nirvana wiring harness to connect the Duos midrange and tweeter horns and woofer module. Gordon was right in his recommendation - the Nirvana provided the exact synergy I needed with the other equipment in my system to give me both good sound and even more importantly, good musicality (which is the ability to play music well and distinct and different from sound). At that time, I used the excellent one-box Meridian 508.20 CD player as a digital front-end. I later purchased a Jerry Ozment designed and built Audio Logic 2400 parallel-processing vacuum-tube digital-to-analog-converter (DAC) to get tubes into the signal chain as early as possible. With the design of his Audio Logic 2400 DAC, Jerry told me that the differences in the sound quality of digital interconnects would be minimal. He said I should expect excellent results with a well-designed but inexpensive digital interconnect. While not inexpensive, I purchased the Cardas Neutral Reference digital cable ($198 for 1 meter). In spite of what Jerry Ozment had told me, when I reviewed the Cardas Golden Reference cable set in The Da Vinci Cables, I couldn't help but wonder. Would I hear any significant difference with a Nirvana digital interconnect between my Meridian 508.20 and Audio Logic 2400 DAC to give me a complete Nirvana wire set from source to speaker? This thought kept pestering me in the back of my mind. I finally contacted Stephen Creamer at Nirvana and asked him about a review opportunity for his digital interconnect. Stephen agreed and sent me the Nirvana Transmission Digital Interface which he recommended for my system ($645 for 1.5 meter). do" attitude in selecting "ultra-pure aerospace-grade materials" for all the components that go into his cables. If you noted my comment above about the distinction between sound and musicality, you've already figured out that Stephen's desire for his cables to represent the "pinnacle of accuracy" and "deliver the ambiance of the event along with the emotion of the artist" resonates highly with my audio and musical values. The Nirvana Transmission Digital Interface is described as an "ultra-wide bandwidth digital data cable". The center conductor is silver-plated oxide-free copper that uses seven-layer aerospace-grade amorphous PTFE® tubing with an air core for insulation. Next comes a layer of proprietary Nirvana shielding that is said to "virtually eliminate" radio frequency interference (RFI) from the airwaves, electromagnetic interference (EMI) from electronic devices and triboelectric noise (where materials become charged by coming into contact with another different material) from contaminating the digital signal. The shielding is then wrapped with three layers of multi-ply PTFE® laminate to "suppress shift and insure vibration damping". The cable jacket is a fiber mesh. The cable is terminated with either a 75ohm BNC connector provided by aerospace and military specialist Amphenol® or a modified RCA connector. The review sample came with an RCA connector. dawned on me how fast the Nirvana was compared to the Cardas, and how as a result the Cardas sounded a little grainy by comparison. I swapped out the Meridian 508.20 as a transport for the Superscope PSD300 CD-R/RW direct-to-disc recorder/player that's in for review. The Superscope's pro-level CD-R/RW drives (yes plural - it's got two) gives a level of resolution and detail that's not available from conventional audio CD transports so it came in useful for evaluating the differences between the Nirvana and Cardas digital links. First up for a listen with the Superscope was one of my new favorite albums, Beautiful Dreamer, the Songs of Stephen Foster [American Roots Publishing ] with tributes by Raul Malo, Yo-Yo Ma, Edgar Meyer, Mark O'Connor, Alison Krauss, BR549, Alvin Youngblood Hart, Judith Edelman, The Duhks, John Prine, Henry Kaiser, Beth Nielsen Chapman, David Ball, Michelle Shocked, Pete Anderson, Grey De Lisle, Mavis Staples, Ollabelle, Roger McGuinn, Ron Sexsmith, Suzy Bogguss and Will Barrow. This album has such a high level of musicianship that it's almost scary, with the arrangements of Foster's songs truly brilliant. If you like progressive folk, roots, bluegrass, old-timey or new hippie music, you should run out and buy this album without a second thought - you'll be glad you did. On Beautiful Dreamer, the Winnipeg/Manitoba progressive folk group The Duhks perform a stunning arrangement of "Oh! Susanna" with an exotic Afro-Cuban feel to the musical vibe that makes you want to get up and dance. Duhks lead singer Jessica Havey's voice sounded very slightly sibilant with the Nirvana, while the sibilance was completely absent with the Cardas. Unfortunately, sibilance wasn't the only thing absent with the Cardas. There's also lot of nuance and micro-detail gone, making the music a little less interesting than it could be. Next up was Nick Drake's darkly beautiful and gripping Pink Moon album [Island 422 842923-2]. Pink Moon is a solo acoustic album with Nick's despair tinged vocals accompanied by his talented guitar playing and a touch of piano. Troubled by depression, loneliness and alienation, Nick died of an overdose of antidepressant medication in 1974. On "Things Behind the Sun', the Nirvana was cleaner sounding, more detailed and had a greater sense of air and space. There was more nuance and inner detail there too and it was easier to make out what Nick was doing with his masterful guitar playing. By contrast, the Cardas was less detailed, slightly veiled, warmer and darker overall. I think the most telling test came when I used the Superscope PSD300 CD-R/RW direct-to-disc recorder to record guitar tracks of my Gibson Advanced Jumbo acoustic flattop and my 1948 Gibson Super 300 acoustic archtop jazz guitar using the Superscope's internal microphone. There's no doubt about it, the sound with the Nirvana TDI came much closer to the actual sound of the guitars than the Cardas did. The woody and bright sound of the unamplified Super 300 was preserved, as was the bigger, bassier and warmer-sounding Advanced Jumbo. The Cardas had a softening and warming effect on both guitars that made them sound less like themselves, and there was a loss of resolution of the sound of the individual strings in comparison with the Nirvana. If these two digital links were SETs, I'd say the Nirvana reminds me most of the voicing of the spectacular Yamamoto 45 SET amplifier I recently reviewed - a clean, refined, detailed & nuanced presentation with plenty of air and space. The Cardas Neutral Reference is more like a 300B SET: natural-sounding midranges with a powerful mid-bass and punchy pace & rhythm, a touch of warmth and a darkish richness that's easy on the ears. The Nirvana sounds more extended and uniform at the frequency extremes, lacking the Cardas' mid-bass emphasis. The Nirvana also recovers a lot more top-to-bottom detail than the Cardas so that you can hear more of the inner workings of the music, highlighting the different pieces that make up the whole. Strings on guitars, banjos, mandolins, cellos are more resolved. Backing vocals obscured by main vocals become disentangled. The Nirvana further offers an increased sense of space and air compared to the Cardas. Mind you, the Cardas is not a bad digital interconnect: it has a warm and forgiving sound that I think many would like, particularly if you have a bright-sounding system. It also has a Naim-like punchiness for pace and rhythm. But there is a definite loss of information compared with the Nirvana and any information lost at the source is lost forever. My recommendation would be to preserve as much source detail as possible and then warm up the sound later in the signal chain if you need to. In my Da Vinci Cables article, I concluded my comparison of the Cardas Neutral Reference and Cardas Lightning 15 digital interconnects by saying that "Jerry Ozment was right. I didn't hear huge differences between these two digital interconnects". Now with the perspective that comes from new experience, let me say this: Jerry didn't have the full story. The truth is that the Nirvana Transmission Digital Interface is enormously better-sounding than the Cardas Neutral Reference hooked up to the Audio Logic DAC in my system. The Nirvana Transmission Digital Interface peforms at a higher level of sonic and musical achievement than my reference Cardas Neutral Reference. The Nirvana Transmission Digital Interface at $648 (1.5 meter) costs over three times the Cardas asking price of $198 (1 meter). Is it worth over three times the price of the Cardas? If you want to get all the information possible off your disks, the answer is yes!